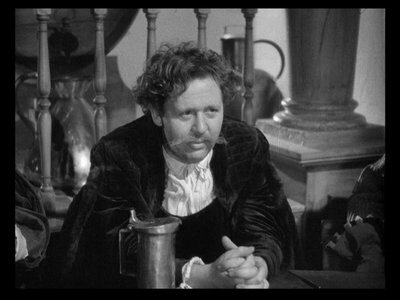 My most visceral reaction to "Rembrandt" (1936), directed by Alexander Korda for London Film Productions, was amazement that Charles Laughton could pull off such an engaging role. If you have only seen him in films like "Mutiny on the Bounty" and other films in which he tends to bellow instead of act, this film is a revelation. He is quite charming and manages to portray his subject as a bit of a bon vivant and, indeed, almost as a bit of a dilettante, though obviously a talented one. I enjoyed this film very much. Instead of trying to follow Rembrandt's life closely, it picks out vignettes that say something about his emotional motivations. Indeed, some of them really have nothing to do with significant moments in the man's life, but they do speak to the spirit of the man. Clearly, the screenwriters figured that anyone really interested in the course of the man's life could go and read a biography. Here, instead, they focus on the telling detail, the pivotal moment, the decisive decision. The trouble with this approach is that occasionally we lose sight of the man, indeed, we lose sight of reality. The myth that "The Night Watch," Rembrandt's most famous painting, was ridiculed and led to Rembrandt's eventual bankruptcy is trotted out and made a centerpiece of the film. To the filmmakers' credit, though, this event becomes part of a larger implication of the cause of his financial struggles - his refusal to conform to social expectations with regard to his paintings. His choice of a street beggar to portray a King illustrates this nicely. So, while the detail is false - "The Night Watch" was a success upon release, not a failure - the larger point about Rembrandt's insistence on painting what he wanted, not what others demanded, probably does capture a bit of the spirit of the artist. He clearly painted what he saw and felt, not what the market of the moment demanded, and his dark painting style probably did account for many of his troubles. Elsa Lanchester was a very underrated actress. Oddly, for a biography of a painter, it is odd that Rembrandt himself is rarely shown painting, and we see few of his paintings. This clearly had to reflect a choice made by the filmmakers to show Rembrandt's life, as opposed to his occupation as a painter. The decision works, but it tends to give the film a disjointed feel because it makes Rembrandt look like a bit of a slacker and, as already noted, a dilettante who can't handle a normal job. A man with his prodigious output of paintings must have worked very, very hard at his craft, but this does not come across at all. 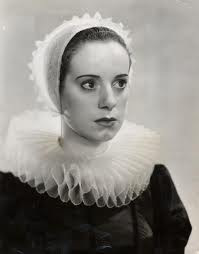 A slightly softer look for Elsa Lanchester. 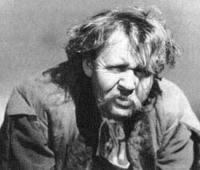 Laughton carries the film with élan. 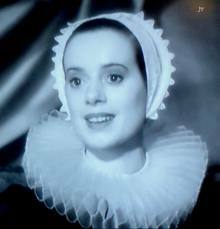 The pretty Elsa Lanchester, Laughton's real-life wife (lucky man), lights up the screen as Rembrandt's second wife Hendrickje Stoffels and is portrayed as the perfect companion. The heavy in the film is Geertje Dirx, portrayed by Gertrude Lawrence, Rembrandt's housekeeper and lover. She is shown to be a shrill opportunist who ultimately is cast aside in favor of Hendrickje, though she does get to defend herself at one point by noting that she had devoted her life to the man, with little to show for it. Charles Laughton showing a softer side of his subject. A party scene at the film's end with some young folks who are celebrating something or other gives Rembrandt a chance to spout some philosophy and sort of summarize his life. They don't at first know who he is, but adopt him for the day because his appearance amuses them. 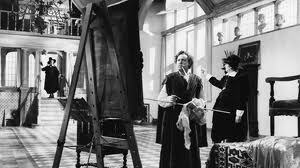 This is probably the best scene in the film because of the shift in emotion that occurs when Rembrandt's identity is revealed (at least one of the party is himself a painter, unidentified). But the scene also points up the film's weakness, because here we have a supremely famous subject and all we are learning about him in the scene is some off-handed philosophizing that he conjures up upon demand. Pearls before swine and all that. 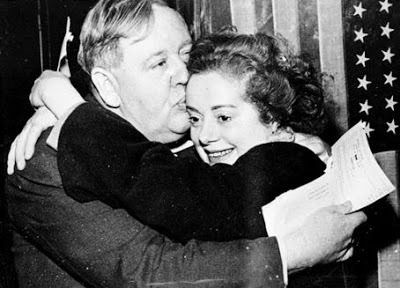 Charles Laughton and Elsa Lanchester were married in real life - both were terrific actors. 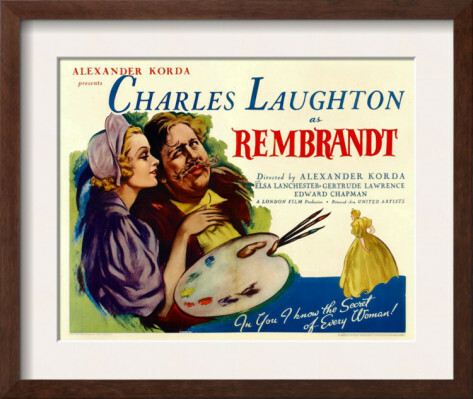 "Rembrandt" is a sentimental tone poem about the painter and a triumph for Charles Laughton, who gets the look and the attitude down if not quite all the facts. Just don't expect to learn much about what the artist actually did.